Please click on the small images to see the large views. 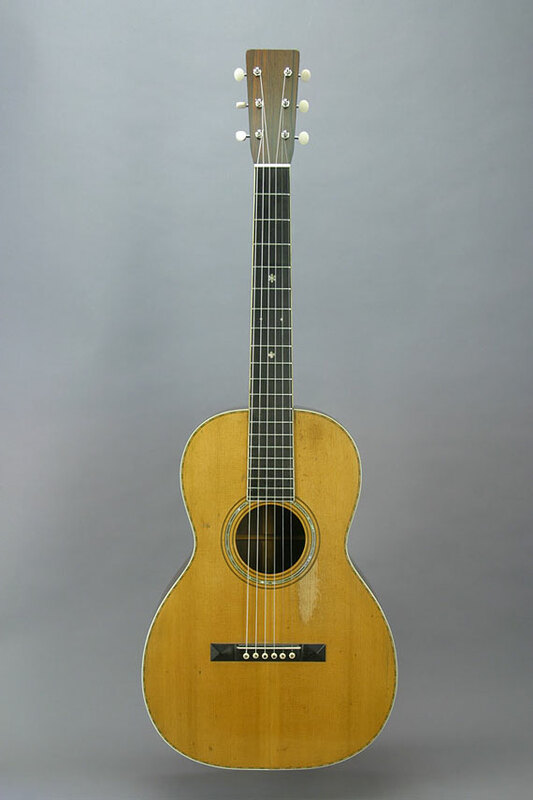 Whomever rebuilt the peghead on this fine old guitar did a pretty good job, but didn't adhere to Martin's traditional styling when converting it from a slotted style to ivory friction pegs. 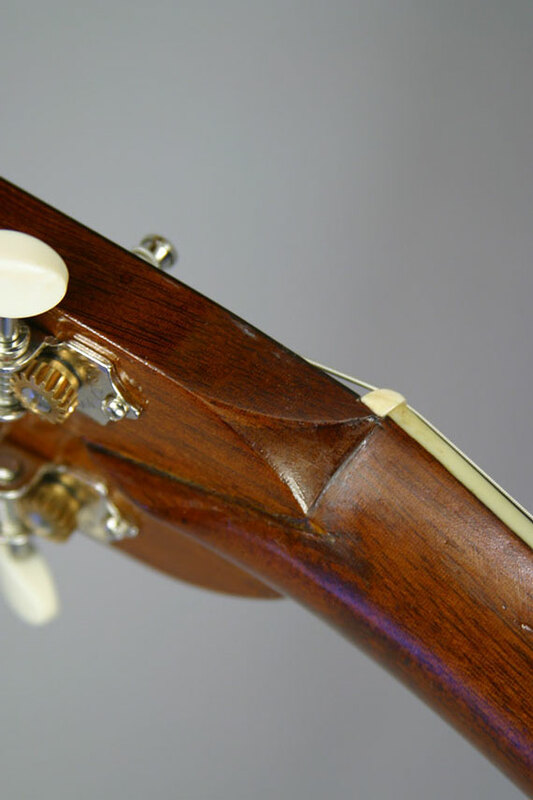 Now that I think about it, there's no way to tell for sure which style peghead this guitar had originally. As it stood when it came to me, it just looked wrong. 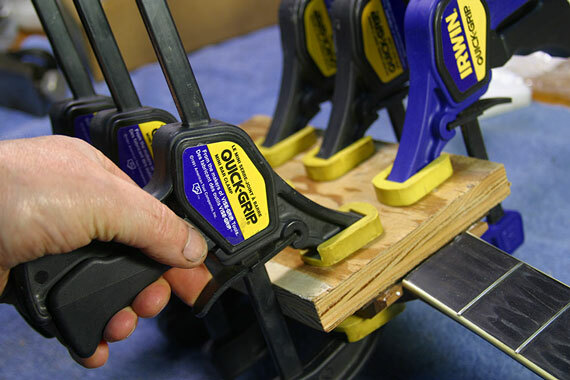 The pegs were spaced really far apart, with two of them right at the upper excessively rounded corners. 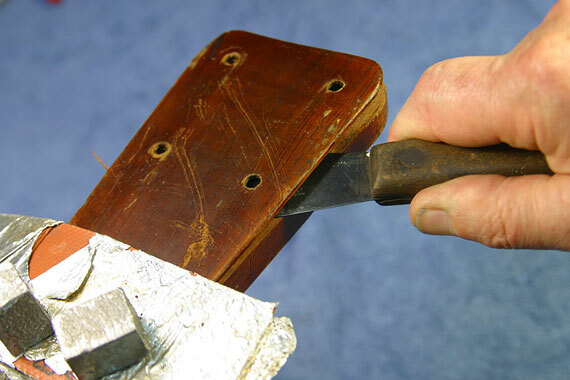 Both the front and back of the peghead had been veneered, and the sides had been widened. 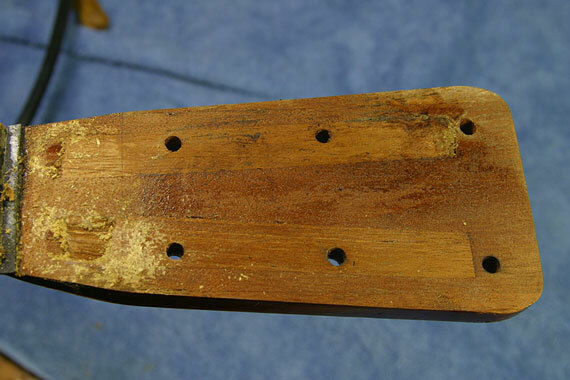 Strangely, the added wood was Spanish cedar, which would have been appropriate for the neck material of an earlier guitar. 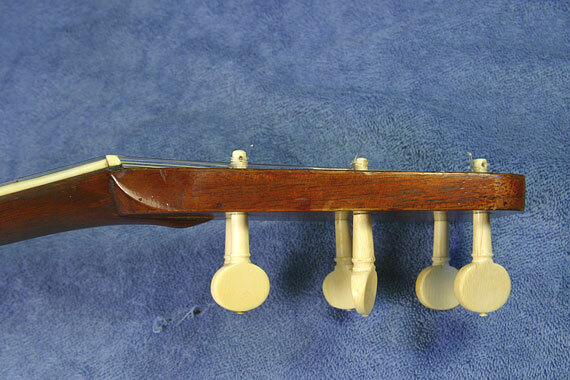 This one has a mahogany neck. 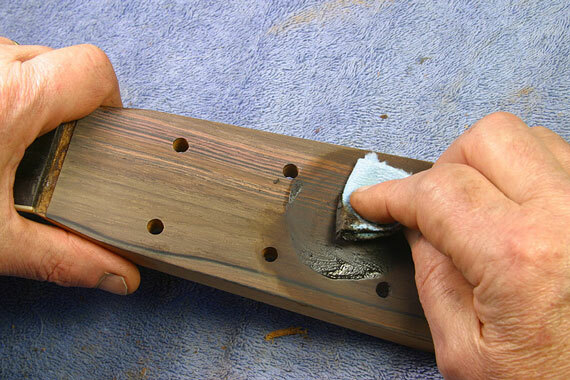 Of course, the face veneer would have originally been Brazilian rosewood. 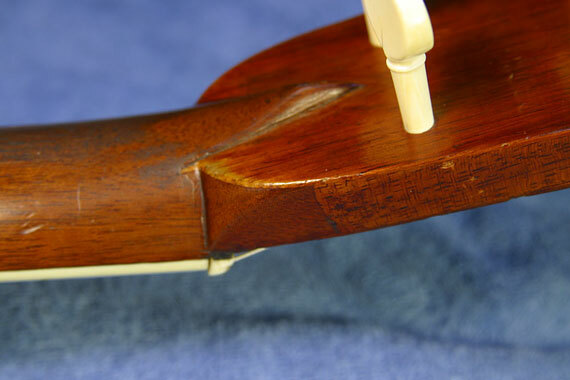 My first operation was to remove this veneer, and I worked it in sections using my L.M.I. 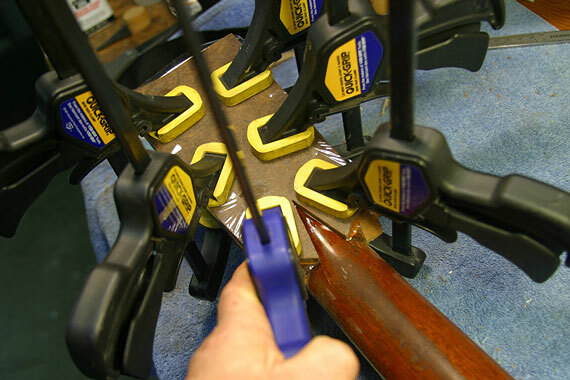 heat blanket to soften the glue. 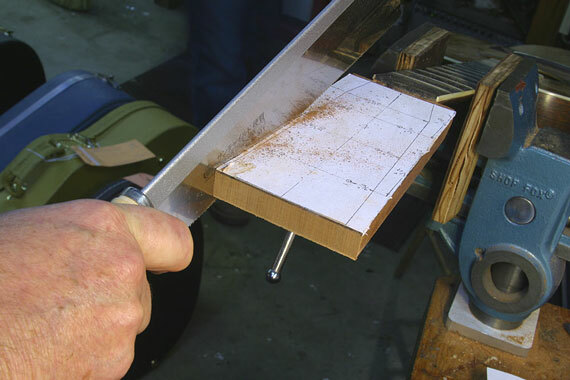 I used the same technique to take off the back veneer. Then I was able to see the innards of this complex package. Filled slots, lots of holes. 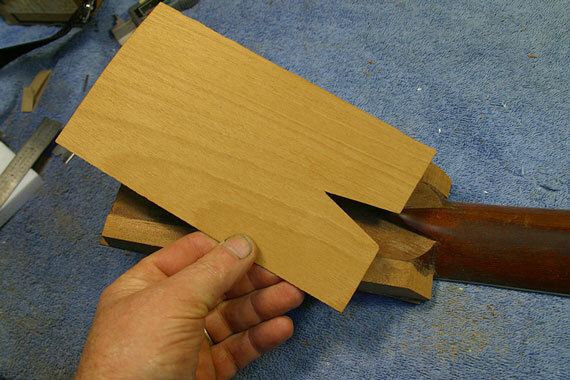 Since I had to remove the side pieces which were of the wrong material, I set up on my Grizzly "wood mill" and milled the sides to straighten them, and to bring the joint of new and old wood as close to the transitional "corner" that would be carved in shaping the edge of the peghead. You'll see more of that later on. 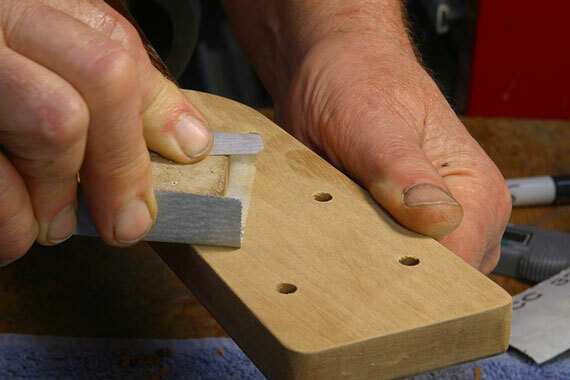 I eventually had 12 holes to fill, including the old side-mount tuner holes. 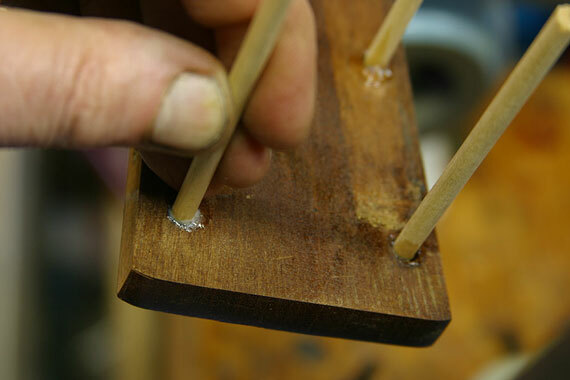 I just used ordinary dowels. 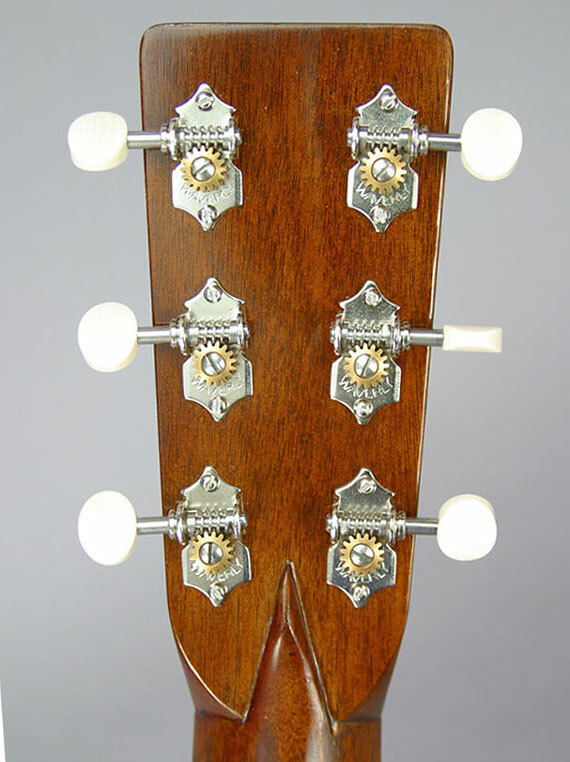 The owner of this guitar wanted to have it fitted with regular Waverly tuners on a solid peghead. 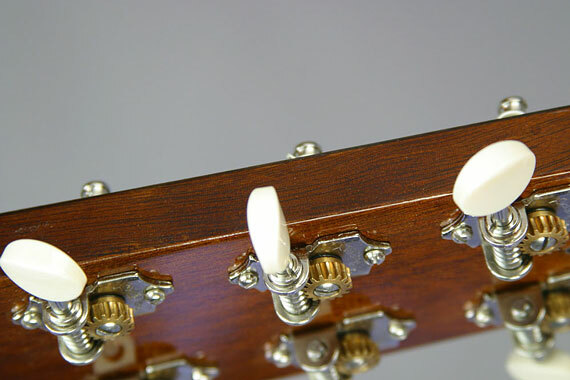 He felt that it was as likely as not original with a solid head because, as he asked, "Where would the guy have turned up original Martin ivory pegs for the conversion if it hadn't been converted to slotted from solid?" Good point,. I thought. In any case, the peghead had been reduced in thickness at the end, so I needed to build it up. 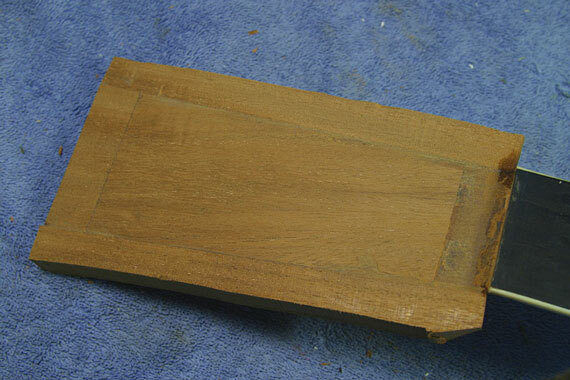 I prepared a tapered wedge of mahogany to add to the front. 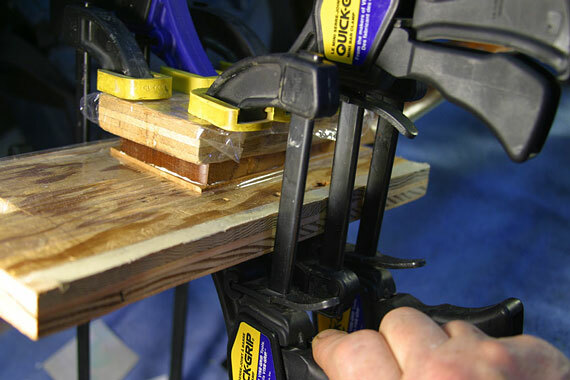 This job gave my clamps a workout. 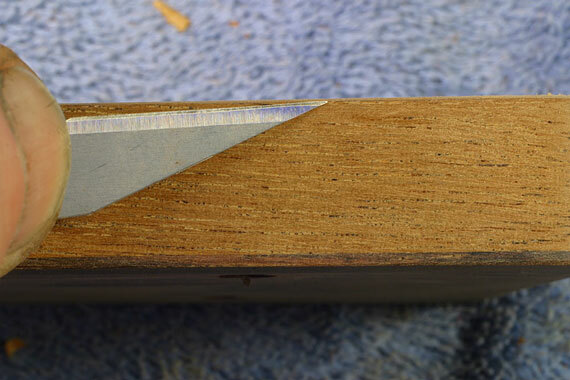 So that the wedge wouldn't be visible from the end, I made an extension with grain running parallel to the length of the peghead. The original had been shortened by all that work. 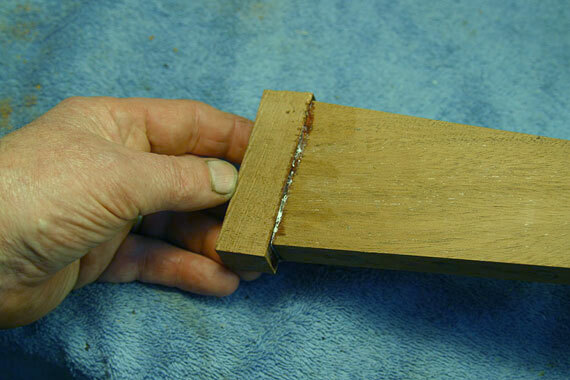 And, I added some extra mahogany on the sides. You may notice that my additions are really huge compared to what's needed. 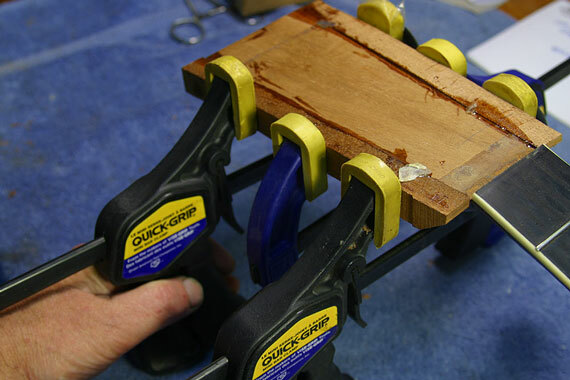 I worked with big pieces so I could avoid using extra clamping cauls - it just made the job go a bit easier. Now, with the built up face, and extensions on three sides, I had a nice big peghead! 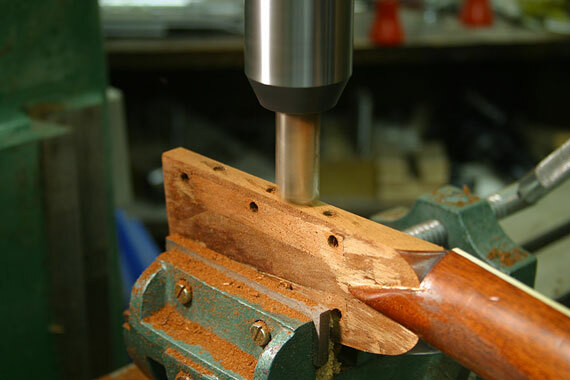 I carefully leveled the back as well, working right up next to the volute. 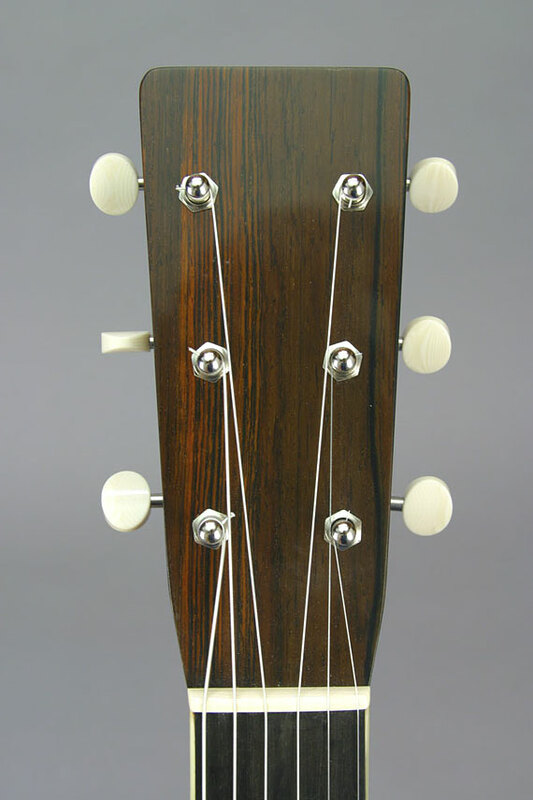 A big Brazilian rosewood overlay for the face. And a very thin veneer for the back. Starting with a sawn piece of mahogany, I sanded it down to about 1/32" I didn't wan the veneer to show from the corners of the back edge. 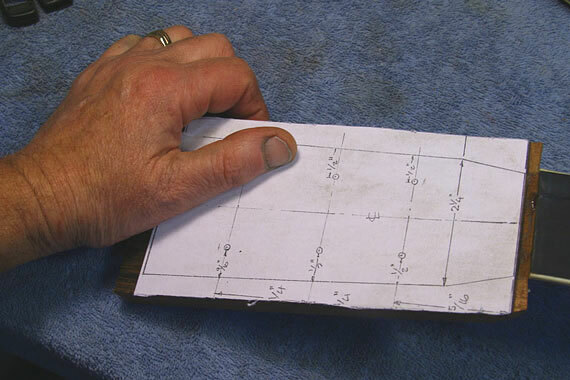 I spent some time plotting out and drawing the new peghead shape on a piece of paper I glued to the surface of the peghead. Generally, I like to do the drawing right on the instrument, so I can keep the shape symmetrical and lined up with the axis of the neck. 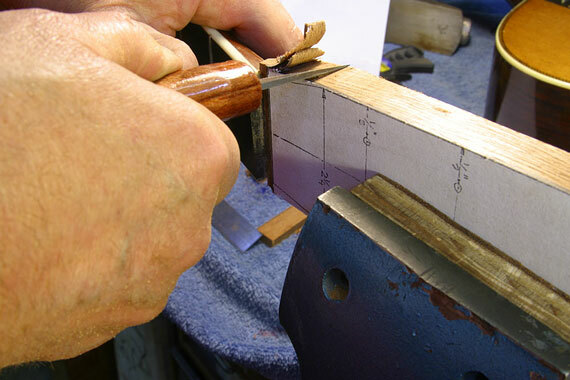 Likewise, I'll usually rough cut the shape by hand and finish it down with a sharp block plane to split my pencil line. 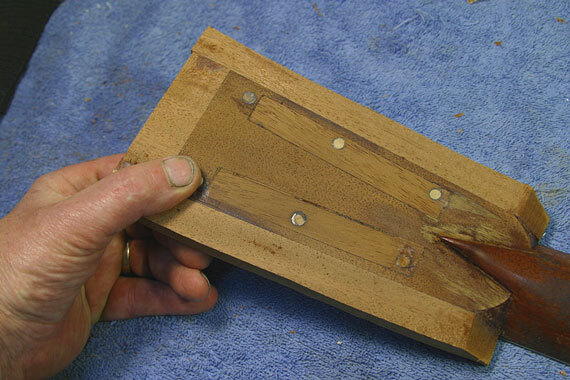 Some knife and chisel work to finish out the shape. If it looks like I'm about to slice my left hand in this photo, don't worry. I have my thumb extended and touching my right hand, so I can work against it as a fulcrum. For a bit more on knife technique, take a look at this. 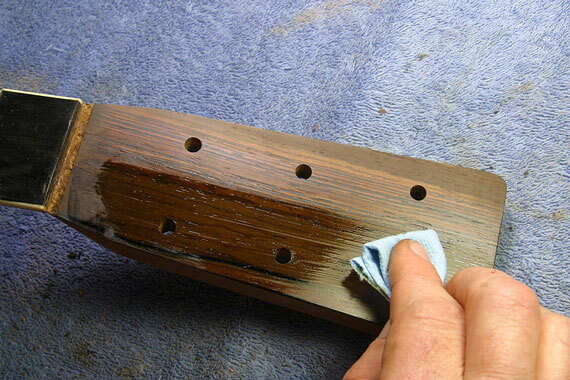 Final sanding and cleanup. 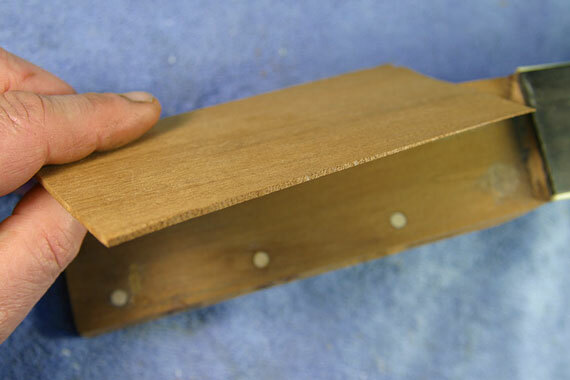 I sanded the back veneer extra thin at the edge, and rounded it over so it would be virtually invisible at the back corner. In this close up shot, you can just make out the veneer line at the back. 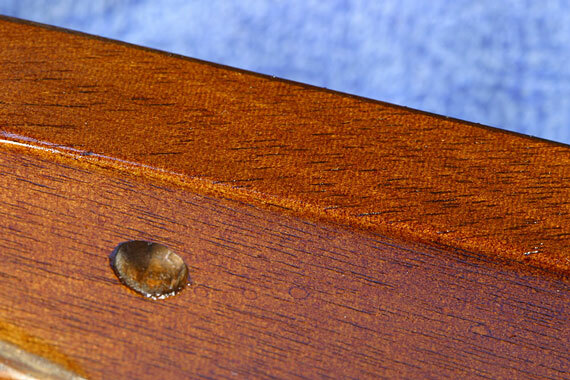 Dark walnut paste filler brought a nice color to my new work. And, some orange shellac to brighten and liven the look. I'm very pleased with how that back edge came out. You'd be hard pressed to notice the veneer line. 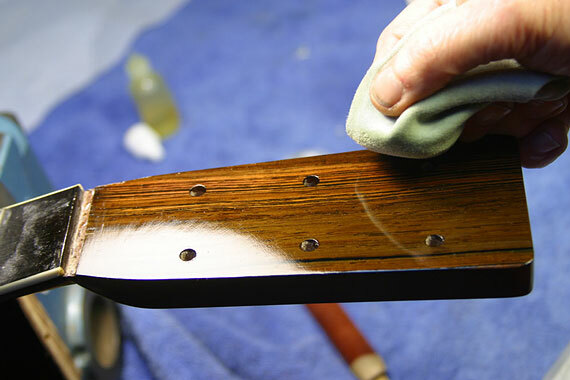 Sanding and leveling the shellac French polished finish between coats. And, a final "spiriting off" brought that soft glow we all like to see on these old timers. The finished job. 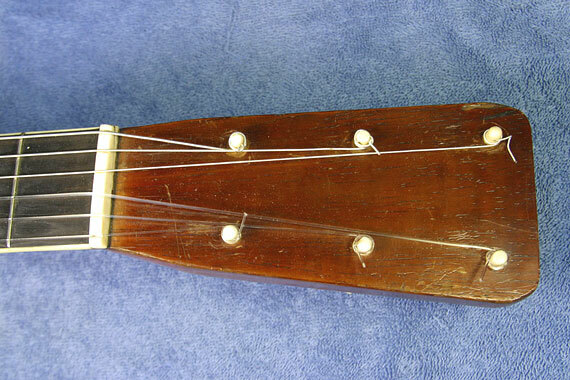 One could, of course, take issue with the "non-originality" of the 90 degree tuners, but this instrument is only about 13 years older than the first solid peghead steel stringed Martins, and it had been through enough modification already, I had no problem with doing the job this way. 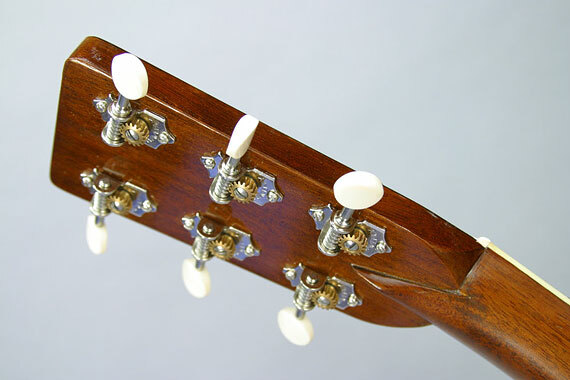 Waverly tuners with ivoroid buttons seemed the logical choice, and they look great and, of course, work perfectly.